The new StageWorks Fresno production of “Urinetown” offers a steady stream of accomplished singing, inspired staging, great costumes and enough bathroom humor to keep a third grader in giggles for weeks. I particularly like how the creative concept for this dark-edged satirical musical comedy, directed by Joel C. Abels, includes a feel of near-constant, sweeping motion in the intimate Dan Pessano Theatre. The action seems to swirl before us. (Dare I say it: like water in a you-know-what whooshing away to you-know-where?) The hard-working ensemble scurries all over the stage, but not haphazardly: The effect is almost like watching a great marching band perform. Precise diagonals, intricate patterns and elaborate, criss-cross blocking unfold in scrupulously choreographed detail. A character like Caldwell B. Cladwell (played by the veteran actor Chris Carsten), the bombastic and devious toilet tycoon whose greed drives the play, is already over-the-top goofy without having him turned into a burbling melodrama villain (who may or may not remind you of someone who gets “Hail to the Chief” played to him on a regular basis). To be sure, the book and lyrics for “Urinetown” (by Greg Kotis) call for many, many silly moments. (One of my favorite lyrics: “And I could never bear / To see you taken where / The guilty pee-ers meet /The toilet judgement seat!”) Yes, it’s melodrama. The premise alone is boldly wacky: Society faces a drought so horrible that people are required to pay to relieve themselves at government-owned amenities. The groan-worthy bathroom puns are abundant. And the character names — Pennywise! Strong! Cladwell! — are the stuff of typical melodrama. But the show is also chilling. It’s about environmental degradation and unbridled corporate greed. It’s no mere romp. What I’ve always loved about “Urinetown,” aside from its Brechtian-fourth-wall-breaking self awareness and clever allusions to prior Broadway shows, is the way it can seem bleak and funny at the same time. As the show proceeds, however, and the acting gets increasingly broad, the tautness of the material seems to slacken. Not by a lot, and not in a deal-breaking way, but I kept wanting to dial it down just a bit. Still, while I quibble with some of the directorial choices in this production — and, again, mine is a very personal reaction — I’m a steadfast admirer of the quality of this show. The cast of veteran local actors is loaded with talent. Standouts include Jeff Lusk and Alyssa Benitez as Officer Lockstock and Little Sally, who accomplish their fourth-wall-breaking with an easy-going but sinister charm. Mark Standriff is perfectly pitched as Old Man Strong, the first character to take a trip to Urinetown. Randy Kohlruss, playing a double role as Officer Barrel and Mr. McQueen, is a master of restrained zaniness. (Watch for his finger-smelling moment.) He’s able to successfully ham it up while not getting bogged down in slapstick. And the two youngest performers, Masie Van Vleet and Scarlett Juarez, keep up with the adults in every way possible. They’re both rugged little entertainers. James Schott brings a humble, earnest likability to Bobby Strong (though his vocals in “Look at the Sky” were a little wobbly at the second-weekend performance I attended). Meg Clark’s vocals as the perky ingenue, Hope Cladwell, are gorgeous, but she struggled to get her overly broad performance past the point of caricature. The same goes for Amalie Larsen as Penelope Pennywise, whose talent for comic timing often gets overwhelmed in the production’s histrionic wave. Erik Valencia has some great dance moves but stumbled vocally as Hot Blades Harry, never giving his big number “Snuff That Girl” the impact it needs. Because of the intimate space, you get to know the supporting cast and ensemble very well. Three of them stand out for me. Emily Estep is radiant both vocally and in terms of stage presence. 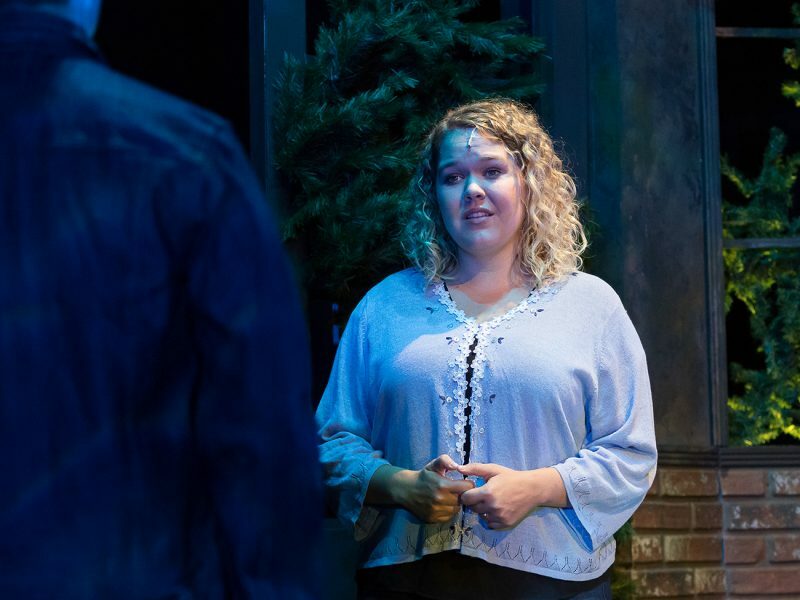 (She’s terrific in “Snuff That Girl.”) Logan Cooley is completely committed every moment he’s on stage, shifting from glowering rabble-rouser to obsequious corporate toady in a flash. Connor Barton’s energy and enthusiasm continually crackles. 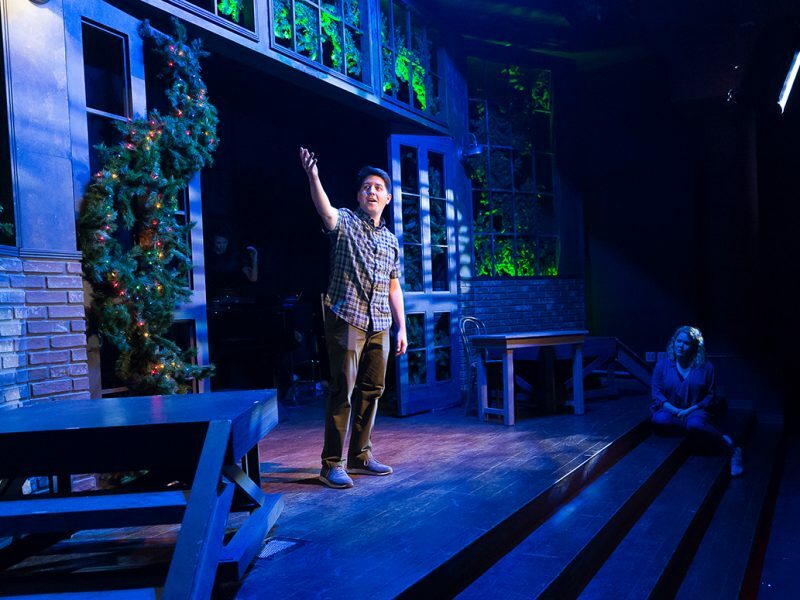 Beyond the goofs and the laughs, “Urinetown” is an interesting and provocative piece to watch in 2018. When it premiered 17 years ago, the direness of the show felt to me largely hypothetical. Lockstock, referring to the audience, asks, “Don’t you think they want to be told their way of life is unsustainable?” Such pessimism seemed plausible but distant back then. Now, I’m not so sure. It all starts to add up: water shortages, pollution, a never-ending heatwave, fires raging across the state, media bashing, explosions of bigotry, the crumbling of civility, the collapse of meaningful political discourse, the feeling that the country itself might tear apart. (And that all happened the day I watched the production.) Many Broadway musicals are thought of as escapist, but certainly not this one. Perhaps we’re all going down the toilet after all. At least the music is happy. “Urinetown: The Musical,” a StageWorks Fresno production, Dan Pessano Theatre in the Clovis North Performing Arts Center. 7:30 p.m. Friday, Aug. 3; 2 and 7:30 p.m. Saturday, Aug. 4; and 2 p.m. Sunday, Aug. 5. Tickets are $28 general, $25 students and seniors.